With four players hitting the court in the singles draw, three of them reached the quarterfinals with Alisa Handrugan falling in the opening round to Iowa Central’s Paulina Junkun 6-4, 6-4. 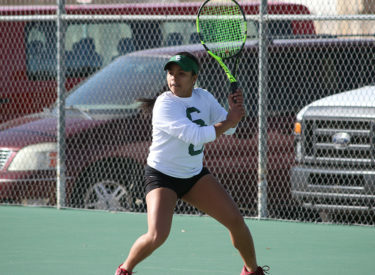 In the quarterfinals, Panta defeated Cowley’s Mariana Rodriquez 6-0, 6-0 before taking down Cowley’s Kristela Vidnere 6-2, 6-1 to advance to the finals. Aveiga was pitted against teammate Alena Macharova in the quarterfinals, defeating her in a close 7-6(5), 3-6, 6-1 match before defteating Cowley’s Takalani Molaoa 6-1, 6-2 to advance to the finals to take on her doubles teammate, Panta. In the finals, Panta breezed to a 6-1, 6-1 victory to win the ITA Central Regional singles championship. After both doubles teams advanced to the quarterfinals, Handrugan and Macharova were defeated by Barton’s team of Julia Candiotto and Mariane Lima 6-1, 6-3. As the lone team remaining, Panta and Aveiga defeated three straight Cowley teams en route to an ITA Central Regional doubles championship, winning in the finals 6-2, 7-5 over Allana Molnar and Takalani Molaoa.